Stereo pre-amplifier for use with turntables fitted with magnetic cartridges. 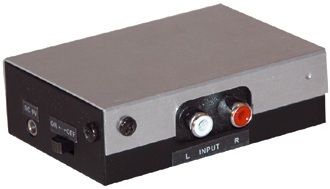 This handy little box will amplify the signal from the turntable, making it suitable for line level (AUX) inputs which match the line or CD input of an amplifier or mixer. Includes 9VDC mains adaptor.